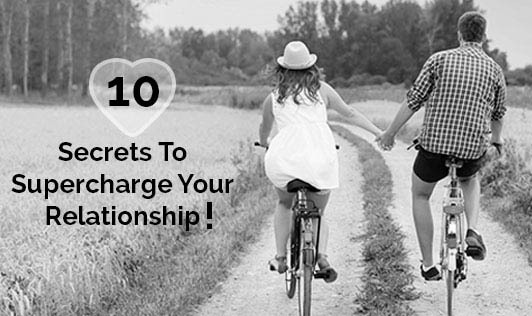 10 Secrets To Supercharge Your Relationship! Fights and Conflicts can happen in all areas of life. It can be within peer groups, spouse, while in relationships, at work place etc. Most fights and conflicts between people seem to start off small, usually over something stupid, and often over misunderstandings. It is very hard to say where and how it started. Every relationship requires some maintenance work. 1.Healthy relationships thrive on successful communication. Be Open and Honest with Each Other. It's also just as important to listen, uncritically, to what he/she has to say. This can usually brainstorm solutions. 2.Try to bring a sense of humor. This is a great conflict de-escalator and makes uncomfortable muments more comfortable. 3.Lighten up. Don't be too serious about everything, have some fun, enjoy life, people will enjoy your company more. 4.Don't Take Things Personally. When you are blamed or criticized find the truth of the matter and admit it, even if it is minuscule, without getting defensive. 5.Get away together as often as possible. Getting away from routine daily life can be great for a relationship. 6.Try to forgive no matter what it is. This character in you can make the relationship go without any hardships. 7.Take a breath. It can help you think more clearly. 8.Hug each other. This is magical for a perfect relationship, especially when you are fighting. It can resolve the issues in no time. 9.Surprise. Throw a surprise into the equation from time to time. It keeps it lively and interesting. 10.Maintain Relationship Balance. Relationships are like two overlapping circles, so try to strike a balance so that there is attention paid to all parts of life. Remember, the above little steps taken every day will add up to everlasting and successful relationship!